I have been a real slack in updating my blog, and I can't wait to get back to it.. My time has been totally occupied since the last 2 months, as I started 'working' at 32F, a kiosk, selling shaved ice at First Subang Mall. Within the kiosk, I'm also selling my baked goods, under a co-branding, called 'Sherlyns Little Dream'. 32F stands for 32 Degrees Fahrenheit, which means 0 Celcius ie. freezing point of water. As the business is all about shaved ice, thus the licensor has chosed this name to reflect what the business is all about, ie. at point of ice formation. I love 32F shaved ice as it has a really soft, smooth, melts in mouth texture. And what's more, its made from freshest and natural ingredients, and love the taste, that is not as sweet as some of the dessert offering out there. From all the shaved ice flavors I've tried, Mango and Green Tea are my top favorite. This 2 flavors are from the Premium flavors, which cost RM5.90 for a mini, and RM6.90 for maxi, which comes with 1 free basic topping. Currently, there are 7 basic flavors and 5 premium flavors offered at 32F. There are more flavors that will be introduced from time to time. Apart from the product, here's sharing some shots around the kiosk. This is a shot of how the kiosk looks like, currently. Seating area, behind the kiosk. Shot during opening weekend. It was surely nerve wrecking during my 1st few shaving experience. Here's some shots around the kiosk... I'm only selecting a few of my favorite shots..
To-date, have received very positive feedback from customers that tried 32F's shaved ice. Come try it for yourself. 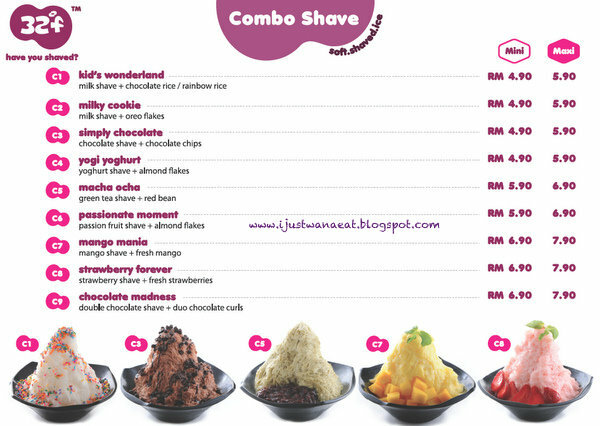 We are currently giving out our loyalty card without expiry date, whereby with purchase of 10 shaved ice, 1 shaved ice worth RM4.90 will be given free. Do LIKE 32F on Facebook. 2 Response for the "32F @ First Subang Mall, SS15"
hello. My name is Vivian. May i know is 32F at First Subang Mall hiring? can i know more detail about this?